An infusion of Chamomile Flowers has been used in hair rinses and shampoos to soothe the scalp and bring out and brighten highlights in blonde, light hair. An infusion of German Chamomile flowers was used on skin to help soothe skin inflammations, sunburns and other burns. When added to the bath it softens skin and helps relax tired, achy muscles and feet. Rich in naturally occurring bisabolol, it improves the appearance of blotchy skin and soothes puffy and dark circled eyes. The same bio-active component offers anti-aging results to tired looking skin. German Chamomile (used aromatically and topically) is an excellent herb for many digestive disorders and for nervous tension and irritability. Its oil has been used to assist in relieving allergies, boils, dermatitis, earache, flatulence, premenstrual syndrome, stress, and to support healthy functioning of the digestive tract. German Chamomile is a very strong antispasmodic and thus relaxes tense, aching muscles and eases menstrual pain. Chamomile also relieves irritability and promotes sleep. 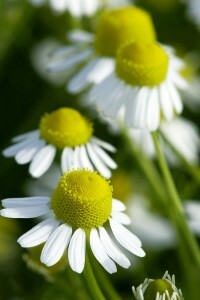 German Chamomile Essential Oil should be diluted before use.